Last Thursday, a Facebook page named Philippine Storm Update (insert URL here) published a bulletin saying that a low pressure area (LPA) has formed in the southwest part of Pacific Ocean and that it has the potential to be as strong as super typhoon Yolanda (international code name Haiyan). According to the post, the supposed super storm will arrive in the Philippines by January 16 or 17. It even published a list of provinces that will likely be on the typhoon’s path. For a country still reeling from the effects of the worst typhoon in its history, it’s perhaps the worst news to receive at the start of the year. 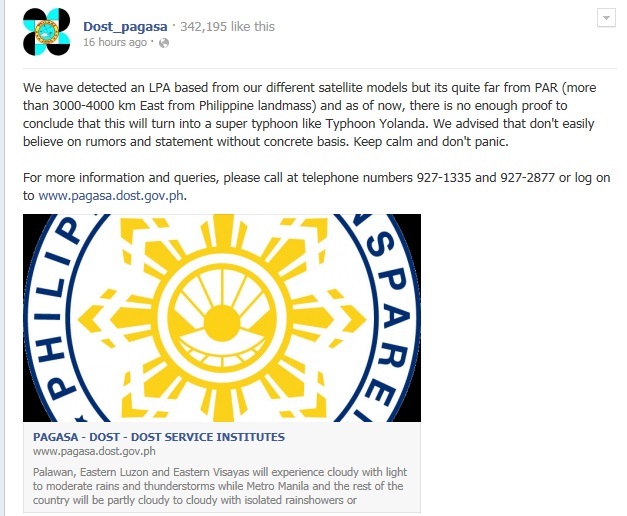 The post has received mixed reactions, with some users expressing alarm while others urged caution. The page has almost 40,000 followers while the actual post has been shared nearly 20,000 times (it has since been deleted as of January 4). For sure, the first typhoon of the year will definitely be named Agaton (take a look at the list of typhoon names for 2014 here). It is also possible that a typhoon will enter the Philippine area of responsibility this month (for reference, it happened last year). Lastly, the coming typhoon Agaton may indeed turn out to be as strong as Yolanda. However, fear-mongering on the basis hypothetical scenarios is certainly not helping the public in anyway. PS: In a future post, I intend to discuss some tips on how readers can assess information they gather through blogs and social networking sites. LIKE ‘THE FILIPINO SCRIBE’ ON FACEBOOK! This entry was posted on Saturday, January 4th, 2014 at 12:50 pm	and tagged with bagyong agaton, philippine storm update, philippines, super typhoon agaton, tropical storm agaton, typhoon agaton, typhoon agaton 2014, typhoon agaton news, typhoon agaton update and posted in hodgepodge, journalism, philippines. You can follow any responses to this entry through the RSS 2.0 feed. The best way to do is to PREPARE for the worst. Everyone must assess the condition of their people and property. We have numerous experiences about how typhoon hits us and somehow, we have evaluated what was done before, during and after the disaster. This time, I am very sure we learned something out of our own experiences. This is not a matter thinking only of ourselves but also of others. Look what happened …. everybody were affected. Both local and international initiatives were very much visible, FELT and nobody wants to experience another Yolanda tragedy. But, we all know the effect of not being able to take good care of our environment. This is the effect of Global Warming. However, there is Prayer to keep us united in wishing, begging for this not to be so destructive. And if possible, through united prayers not to let this to happen. Act together in synergy!